A German startup company named Senic have released a new smart switch designed for control of Philips Hue smart lights and Sonos speakers named Nuimo Click. The sleek design comes in black or white and has 4 buttons on, allowing you turn on and off, and dim up and and down. The Nuimo Click is shaped like a normal mains European switch, it is square and also wireless, so it can just be attached to the wall with no wiring needed. The switch generates enough kinetic engird when the button is pressed, just like the same way the Hue tap works. This smart switch works with both Sonos and Hue lights. 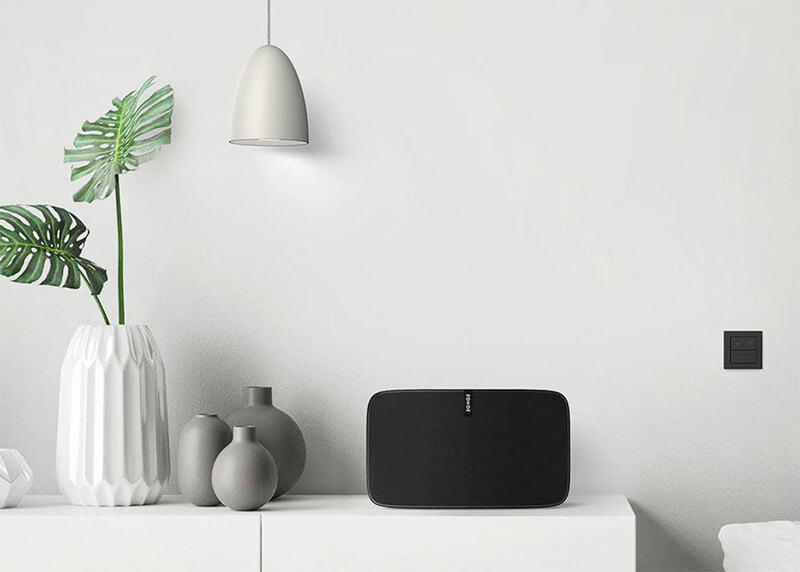 With 4 buttons they do different things for each, the top row has a circle on the left, this turns on and off for Hue, and play/pause on Sonos, the star in the top right will select your favourite scene or playlist on Sonos, then the button row will do adjust the brightness on Hue or adjust volume and track. The single switch is 81mm x 81mm x 17mm in dimension, made from Polycarbonate and has a indoor range of up to 30m. These are sleek and beautiful looking switches and much needed, we expect to see more released over the coming months from other companies. The Nuimo Click can be bought as an add on, which is a single switch, or a starter pack which comes with two switches and the hub. This highlights a downside to these, is the fact that a hub is needed, another box to be connected up, as well as that the price. The starter kit will retail for $229 (£175 in the UK) when it’s available this December, so it isn’t cheap.The additional Click switches cost $70 each (£55 in the UK). You can find out more and pre-order yours here. As well as the Click Senic also offer the Nuimo Control, a smart button that looks and works in a similar way to the Nest thermostat, a click button in the middle and an adjustable ring that you rotate allowing you to adjust there brightness with Hue bulbs, or the volume of your Sonos speaker. Thank you for the feature, Mike! We’re happy to say that Nuimo Click is now available for immediate order on our website. To stay up to date with the latest developments, please check out our updates page: senic.com/updates.